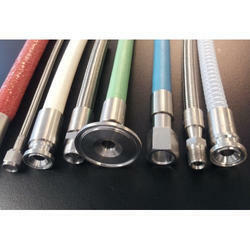 We provide Food And Chemical Hose Assemblies for different types of application . Fittings available like TC , flanges , nuts, dairy coupling , and PTFE coated fittings in SS304 , SS304L , SS316, SS316L and many other grades as per request. Looking for Food And Chemical Hose ?